Group TAIF annually allocates substantial funds to support many non-profit projects, helps fund socially important programs of social organizations and charities related to the revival and preservation of spiritual, cultural and historical heritage, sports development, support health and education. The underlying principles pursued by the companies of TAIF Group have been so far and remain high standards not only in the production area but also in social spheres. In 2016, the companies of TAIF Group allocated RUB 67.6 billion for the implementation of social projects, including support for childhood, education, culture, health care and sports, carried out in the Republic of Tatarstan. The main areas of charitable activity of TAIF Group’s companies are the sponsorship of the leading sports clubs in the Republic of Tatarstan in various sports, support to health care, educational and cultural institutions. A comprehensive sports teams support program of TAIF Group includes sponsorship of key sports events of both national and global scale. RUB 33.2 billion was spent for social, charitable and public projects in the Republic of Tatarstan. TAIF Group allocates a part of its profit to maintain health resorts, recreation centers, children’s health resorts, swimming pools, and ice rinks. In 2016, RUB 2.1 billion was spent for maintaining social and cultural facilities. An active policy of promoting of sport activities amongst TAIF Group’s employees contributes to successful implementation of the production tasks, improvement of the workers’ health and their involvement to active participation in sport and recreational activities. TAIF Group’s companies provide their employees with vouchers to health resorts, recreation and retreat centers, children health resorts, and children recreational camps. 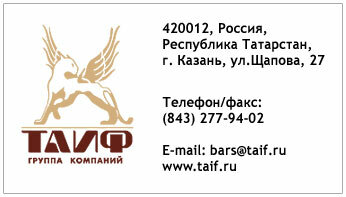 While making every effort to carry out the most effective financial and economic activity, TAIF Group strictly adheres to the policy of social responsibility with regard to its employees, their family members and the population of the Republic of Tatarstan. The companies of TAIF Group never ignore requests for help and do their best to provide all possible support to those in need. Major corporate social programs are aimed at supporting and promoting healthy lifestyles, improving living conditions and quality of life of employees and their families, and financial support to veterans and retirees. TAIF Group’s employees receive medical services in the framework of both the compulsory health insurance program and the supplemental health insurance program. Over 44.0 thousand employees of TAIF Group were insured in the framework of a voluntary medical insurance program in 2016. Investments in the personnel made in 2016 totaled RUB 24 billion. In order to secure the fulfillment of the social commitments by the government as related to pension payment, health care, and support and social security to low-income social groups, TAIF Group’s companies transferred RUB 6.9 billion in 2016 to the Pension Fund, Social Insurance Fund, and Medical Insurance Fund. In 2016, through participation in the Republican Social Mortgage Program, the Group’s employees were provided with 29.3 thousand sq. meters of living quarters. Besides, TAIF Group implements its own supplemental housing program, under which the Group’s employees were provided with 30.8 thousand sq. meters of living quarters in 2016. TAIF Goup continues financing of restoration and construction works carried out in the open-air museum of Sviyazhsk Island-Town and an ancient town of Bolgar. In addition, in 2016 TAIF Group supported the initiative of the residents of the Republic of Tatarstan targeted at the construction of the Islamic Academy in Bolgar and the Cathedral of Our Lady of Kazan in Kazan. In 2016 alone, RUB 1.0 billion was spent for this work, while total spendings since 2012 have exceeded RUB 1.5 billion. On August 15, 2016 Rustam Minnikhanov, President of the Republic of Tatarstan, solemnly launched the renovation and improvement of a urban forest Lebyazhye within the framework of the Year of Water Conservation Zones in the republican. The investor of Lebyazhye Lakes restoration project is TAIF Group.